PRODUCT DESCRIPTION: Trappers Choice Rabbit Lure is great to use when you have that finicky rabbit which seems to be indifferent to whatever you have been using as bait to catch it. 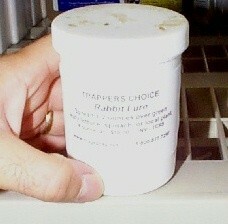 Our special formulation will get any just about any rabbit to enter our trap. RATE OF APPLICATION: 1-2 ounces placed on a leafy plant the animals are used to feeding on will usually work. You can also try adding some lettuce or spinach. Place a small dab or two on either side of the trap entrance so that the rabbit can get a whiff and taste as it enters.